My existing roasting trolley made from a old BBQ frame has been working ok, but I can't store my KKTO out the way. Last Saturday I was driving out my street when my wife spotted a garage sale... and this is what I scored. $5! Bargain! Well in my eyes. There's a bit of surface rust but nothing too bad.It has potential. 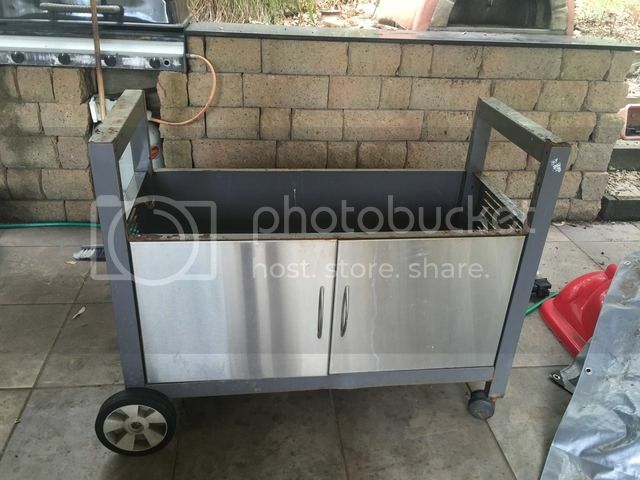 I'm going to install a solid wooden top, make a separate cooler to store inside with the KKTO using a bathroom fan I already have, and build one big pull out drawer on the front for my roasting tools (wooden spoon, scales etc), and I'll have room for my Pizza paddle, and BBQ tools. I'll post up progress when I make some. Please do, I love watching things come to life . The new trolly certainly has potential Lacehim. 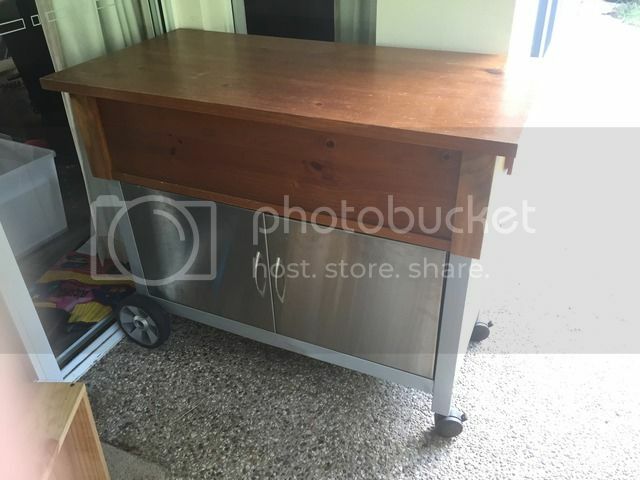 I'm using an old aquarium stand, pretty basic but gets the job done. nice base - how's the top coming along? It's stripped down and ready to paint with hammerite. It's pretty easy to use. 1 coat over the whole thing and you only have to scrap off loose rust. I've got the design laid out for a draw and top so should work out well I hope. Will post up photos soon as I make progress. hows the project progressing mate. interested to see how things are going. I stripped off the panels, scraped off the loose rust and I've just given the whole thing a good coat of hammerite which will deal with the rust. Went with silver in the end. Look pretty good considering what it looked like before. Another coat tomorrow, and then I just have to put the doors on and I'll take a photo. Next step will be doing the wood work for the draw and top. Happy with the progress so far. Great work. Looking forward to seeing progress pics. Me too! My roasting table is due an upgrade so awaiting your inspiration!! Finished Painting. Thank god, it's smelly stuff! The paint I used is hammerite http://www.hammerite.com.au/ which my Dad swears by. He's lives in the UK and you can imagine how rusty stuff gets over there! All I did was scrap off the loose paint and rust, then roughly sanded the whole thing with 80 grit to help the paint stick to the existing paintwork. It needed 2 coats, recoat in 4 hours but the second coat was really to just cover some patches. Easy paint to use. I would have preferred the hammered finish but there was none in stock, but it has a great look, and hides imperfections much better. The back looks much better, and I put the vents around the right way, rather than upside down like the previous owner! lol. The future.... just a little sketch I did to visualise it better. I originally thought of putting the cooler fan inside hidden under a panel on the top, but I think the space would be better utilised with a drawer, so that I can store bits and bobs, and my pizza paddle, and BBQ tools. I'll build a box and make a cooler than can be stored underneath instead. Might be easier to clean out too. 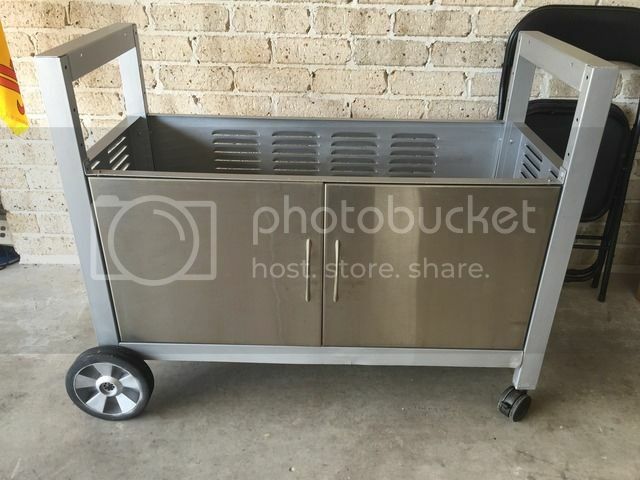 This will be my roasting trolley but also to put next to my pizza oven to lift pizza's on to, and to prepare toppings etc. 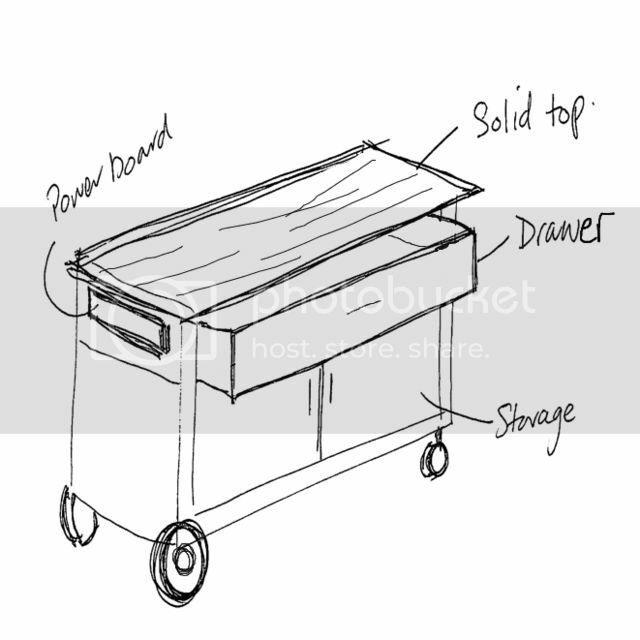 I'm just going to use plywood for the sides and drawer, and probably a thicker 19mm plywood top. Trying to keep costs down a bit. It will be outside, but undercover and out of the rain so hopefully plywood will cut it. Getting rather into this project now that it's painted, so hopefully progress will be made. Still haven't got my head around the sides and back, the posts are quite thick, but the drawer will need to be fitted to the inside, leaving a big gap. Ummm. I was thinking of maybe boxing it in then fitting runners to the inside and fitting the drawer. That's looking great mate. Nice colour scheme. There is nothing better than building something yourself to enjoy. Another option for wood is to use some old timber instead of ply wood. You could get some old euro (EPAL) hardwood pallets for about $5 each (I've seen heaps of ads on gumtree in Melb) and use the slats to give your trolley a reclaimed timber look. 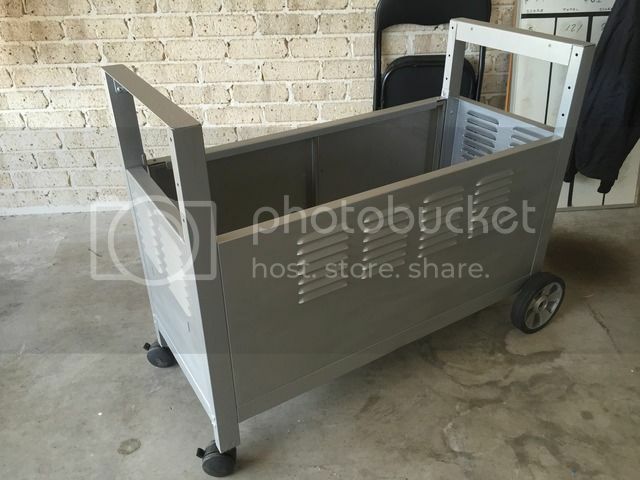 The trolley project has been put on the back burner for a bit while I paint the house to be sold next month, and sorting out stuff for the new house. The old trolley got dismantled the other day and the new trolley is now in the workshop! I always thought it was new house, new baby . Still no progress but will be soon once the dining table is complete. 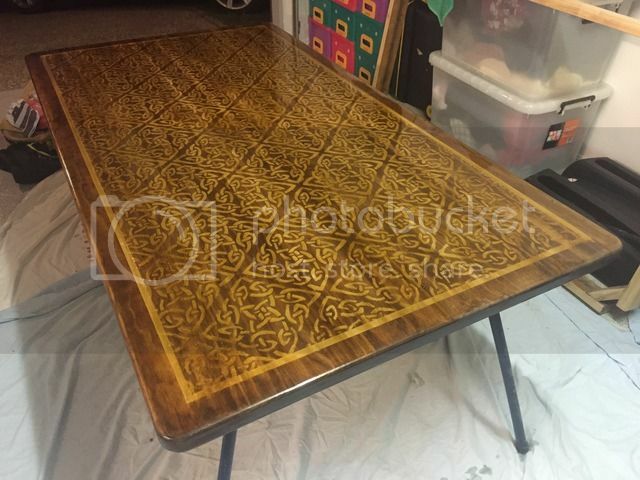 I might upcycle a coffee table I have lying around that isn't selling on Gumtree and get it out the garage. I'll get brownie points if my wifes car fits in the garage afterwards! Yes... using a carport for its intended purpose is laudable, but dull compared to its potential to do stuff. Stuff is awesome! It's finished. Yes a miracle I know. In the end I used an old coffee table with a lift up lid so I can store items like bags etc under the top, and the doors underneath house the KKTO and bits. Back to using a cardboard box as my roasting cooler but I'll build a new one from a bucket when I can. Also finished my dining table. 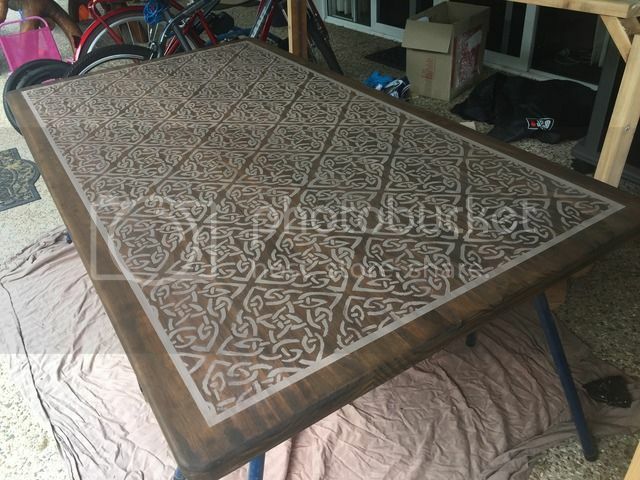 I sanded it back and stenciled it with a home made stencil using white paint, then stained over it and coated it with liquid glass (resin). Happy with the result. The resin isn't perfect but it was my first attempt and I learned a lot doing it and would do it again. Table with stain and liquid glass.